Back before I really got "into" wargaming, I did some military modelling, both single figures and vignettes as well as 3 dioramas. 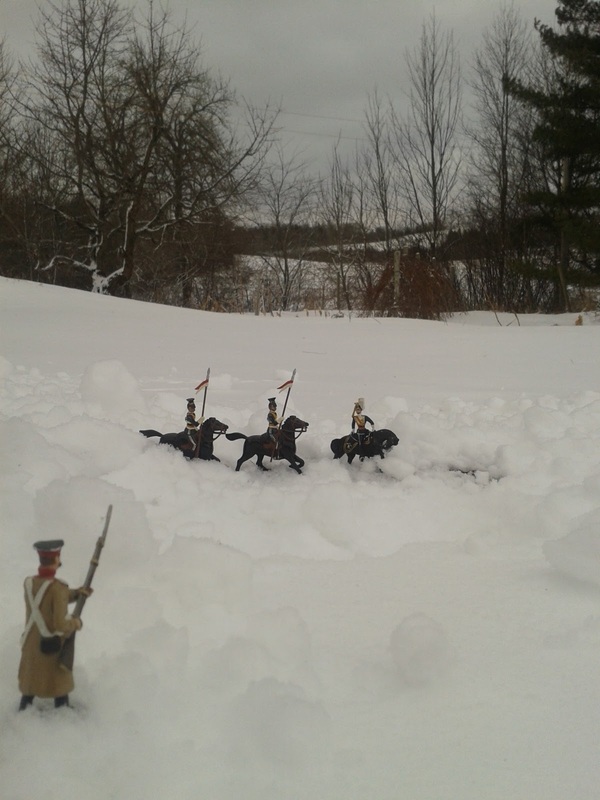 I don't remember if this was spring or fall of 1966 so I might have been 10 or 11 but I remember that Giant supplied the British & American Regulars for this school project, a diorama of the Battle of Queenston Heights. It was of course a few years too early for Airfix's Waterloo ranges but their ACW range supplied the militia. 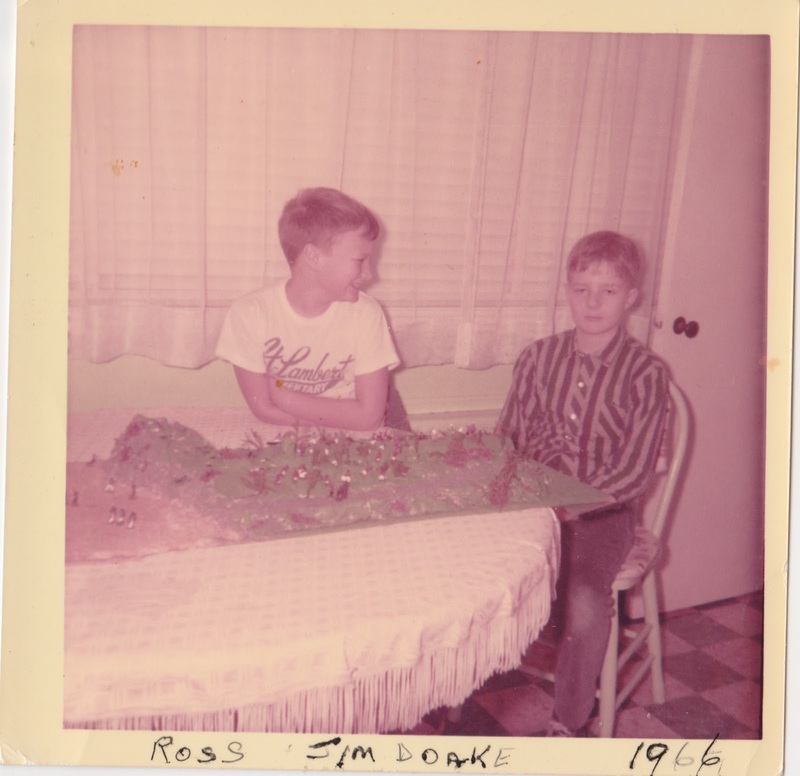 My partner was Jim Doake, fellow boy scout and the only one I have ever played Little Wars with. He had a box of Britain's with an abbreviated set of the rules on the back of the box. We also played at least one Featherstone game in later years. One of those 54's who didn't make it into a diorama but did make it onto the museum business cards and into Wikipedia (anonymously). As I recall, I press ganged a prep into doing some of the figures, not at random, Simon was not only a museum club member, he and I were already playing WRG Ancients with fictional armies created from Airfix figures. I suspect someone has refurbished this but its hard to be sure, it was a few decades ago and its the figures and over all idea that I remember. I'm amazed that it still exists at all after 39 years! The other diorama I made at the time showed a sortie by the Royal Fusiliers against the Americans in 1775, this time using Airfix figures more or less straight up but it does not seems to have survived. Doubtless many of you can recognize the source of most of the conversions. 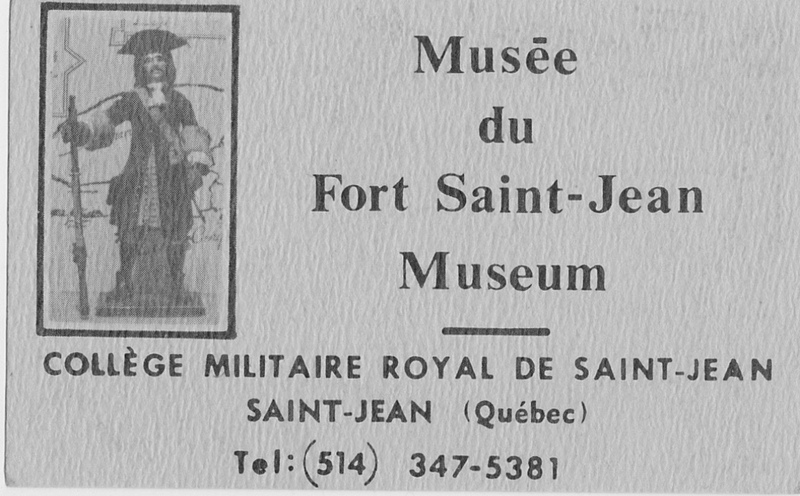 The photo was taken by Eric Ruel, the curator of the Fort Saint-Jean Museum in Feb 2013. As long as I'm indulging in nostalgia, Dr. David Ruddy was the founder and Director of the museum while the curator was a cadet, me for 2 or was it 3 years? 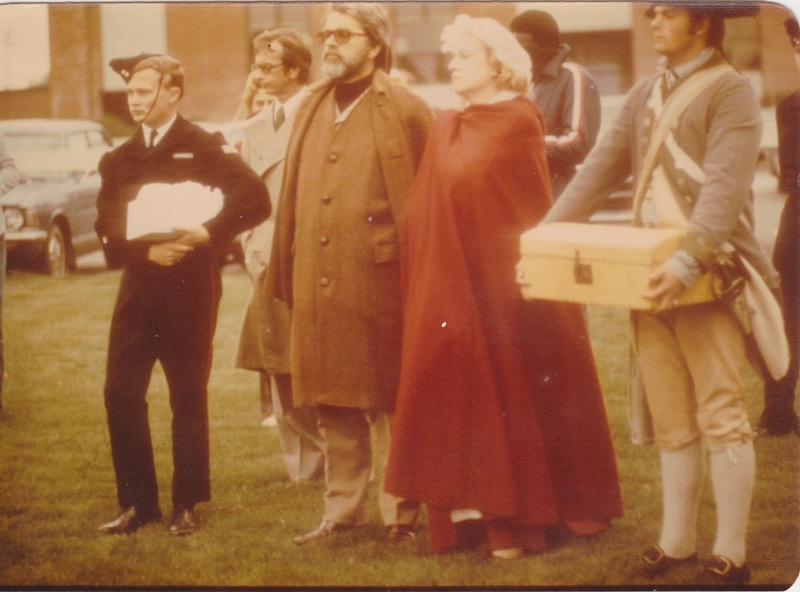 Here he is with me in 1776 when the Museum Club, or for practical purposes, Dr. Ruddy, Simon MacDowall and I helped co-ordinate the visit of the Brigade of the American Revolution on their way to recreate Montgomery's attack on Quebec. Simon & I painted up Rose Miniatures of British officers as gifts for some of the organizers and I am about to present them. Not only was Dr Ruddy a marvelous history professor but he became a mentor and inspiration whose influence has been life long. The last time I was in contact with him was in the 80's after I had left the navy. It finally occurred to me this week to use the internet only to find that he passed away in Victoria in 2011. May he rest in peace. Work continues on Fort MacDuff. 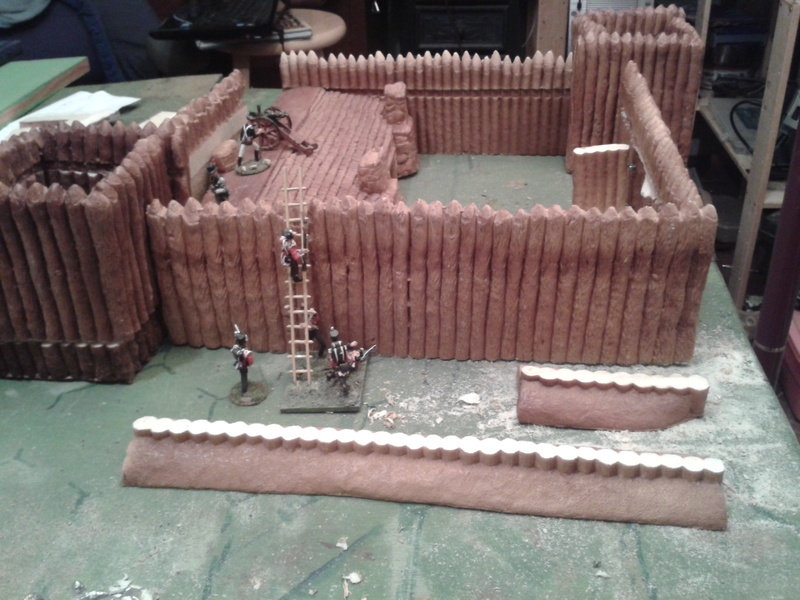 The hardest part so far has been deciding on the configuration since this palisade fort will have to serve me for both sides from the French & Indian Wars to the Oregon Crisis as well as Atlantica and maybe even occasional for Prince Valiant. It seems like almost every North American fort had a unique layout, however, there seem to be some trends. The British and earlier French seemed to have usually gone for a rectangle with 4 corner bastions with these being either palisades or earthworks but sometimes conforming to terrain and with extra or fewer bastions and ravelins. Some US forts also followed this layout. Most such forts had internal buildings and/or blockhouses. This seemed like the best choice but the bastions are tricky and I didn't seem to have enough matching material esp for the blockhouse. Mockups also ended up being too big or too cramped. Many 1812 and later US forts and some British had corner blockhouses instead of bastions, sometimes only on 2 corners or also mid-wall. These were usually traditional, horizontal interlocking log, roofed blockhouses but some 1812 ones were 2 story without the overhang. Roofed structures are often a nuisance when wargaming and I find 4 sided roofs tricky to build. I also determined after some experiments that I didn't have enough enough horizontal log corners to make 2 blockhouses without getting creative. I decided to compromise by having 2 open blockhouse/bastions taller than the walls so neither fish nor fowl but reminiscent of both. 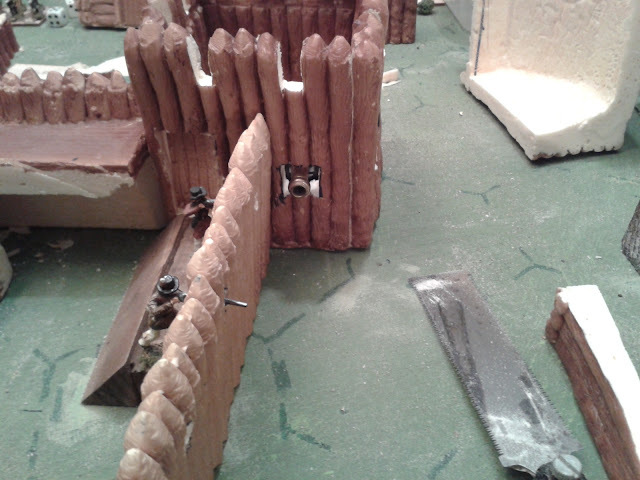 Now, in the movies and old play sets, soldiers stand on a catwalk and lean over the stockade to shoot. The period manuals call for loopholes and a banquet inside and reluctantly I went that route, perhaps Prince Valiant can do without a wooden fort or use the loop holes for archers. The recreated Ft Meigs has an interesting twist, embrasures in the form of a crenelation made by chopping off the top of ever 5th or so log. This looked easier and attractive and thus very tempting but I restricted it to the fake bastions since I don't recall seeing it elsewhere post medieval times. It would be nice to fix the multitude of small pieces that I've created to a base board but it has to be easily storable and transportable so I'm aiming for 4 pieces once all is said and done. Lots left to do before I start painting. Oddly I seem to make the same kind of measuring and cutting errors in miniature that I do in real (sic) life . Well it appears that I'm going to Huzzah in Maine come May and it appears the value of my Davy Crocket stockade is less than its postage. Add these two things to this being the bicentennial of the 2nd year of the war of 1812 and I decided to reduce the size of the stockade, fashion the bits into Ft. MacDuff and get that Ft. Meigs game ready for the road. Inspired by shots of Red's cavalry Tin Soldiering On into the garden in search of Spring, I decided to see what was happening here. A lone Russian Sentry (Ivan) watches a patrol of under dressed 17th Lancers floundering in the snow. One of the test games from this weekend. The decision to forego the attempt to find a One Rule solution (One rule to ring them all?) means that while I plan to share some mechanisms where it makes sense to do so and keep them identical, I am also free to do some things quite differently. In this context, I was looking at pictures of previous cardtable games and noticed how prominent all the little marker dice were when there was one for almost every stand. Then I remembered how annoying it was to run out of them midgame. I also remembered that I need something like a pin result for late 19/early 20C games which brought my original RCW rules to mind as they used an older pin/kill step rather than a roster-ish 3/4/5 hits. So it was that I found my self revisiting the Square Brigadier with an eye to finding an alternate mechanism to deliver a broadly similar over all result. Since units are being treated as entities not clusters of elements and since the theory is that hits are cohesion as well as casualties an improved version of the 2 step pin/kill process I used in my old Lawrence of Arabia rules in the late 80's seemed suitable. This was similar to one I used in my first RCW game and such as was used in some versions and variants of Bob Cordery's Portable Wargame. I managed to try out the ancients version of the rules on the weekend and a battle report has been posted to my Gathering of Hosts blog. So far so good. Its time to buff up the late 19th/early 20th century section and try it again. There may be a few readers who are wondering what happened to the Square Brigadier and my plan of playing at least weekly card table or portable wargames over the winter. Have I given up on them or perhaps been playing them in secret? No and no. The new wood stove and heat pump have made my upstairs hobby room a cozy place to be even in -20C weather which has changed the dynamic a little but I still need to spend more time down in the family room. No, I have been pondering the answer to the dilemma posed by the mis-match between the size of the grid and my figure basing . ACW troops based wider than the grid and jostling for position. I cannot imagine what the Bleep! I was thinking when I made the new grid 3" when the units I was planning to use were mostly on an 8 cm frontage, but there we are. I don't really want to redo the board and in any event a board designed to fit the size requirements but using a larger grid would mean fewer squares and the success of the fall games was due in part because of the increased number of grid areas (120 vs 64) which allowed room for more maneuvering and more units allowing more complex scenarios. But, I also don't want to rebase a lot of figures. Luckily, the success of the MacDuff games has reinforced the idea of maximum differentiation between parts of my collection which means it would be possible, even advantageous, to have separate upstairs and downstairs armies, preferably in different periods. Basing and organization of my early 20thC armies is still up in the air but I don't mind that they don't fill a grid area anyway. So they are one contender whether as Russian Civil War, WWI or more fictional stuff. I would as soon not confuse my ACW armies so will leave them as is, designed for full table non-gridded Hearts of Tin games, after all, I can always squeeze them in or use 1 stand units if needed and have enough figures on hand that I could do a small second set of opposing portable armies if desired. Again 8 cm wide units jostling bt the 6cm one looks quite comfy. The big surprise for me was that I enjoyed using my 25mm ancients/medieval troops on the card table. That was not part of my original plan. The 8cm bases don't fit but the migration to them hasn't gone very far and I still have numerous troops on 6cm bases or based as singles. Enough for a test game anyway and it works, I have no real reason to not just slip back to the traditional 60mm bases putting possibly 3 ranks of 4 for OS heavy infantry. A test card game layout of the Grant version of Platea. I am using 2 x 60mm units for each of his 40 man units. Its funny how things go sometimes. When I started laying out this past game, I had very low expectations. There was a low figure density, limited tactical options and I had no back story to build around. So I started hauling out figures and then just followed the little inner promptings. By the time the game was well under way, I not only had a back story start to develop but it looked like I had backed into solutions for several questions that had been dogging my fictional setting and associated campaign for years. But more on Atlantica and on how the positive ripples from the clarity will benefit the card table game in a later post, let me go back over the game, what actually happened and how various things worked. 1 Steam Boat with 5 gunners, a mortar rated as superior firepower. 4 units of 20 Irregular Light Infantry with a mix of muskets, pikes and hand weapons, all figures being counted as Inferior firepower with melee weapons rather than trying to track individuals. 5 units of Irregular heavy artillery with 4 crew each. Total 120 figures behind cover. 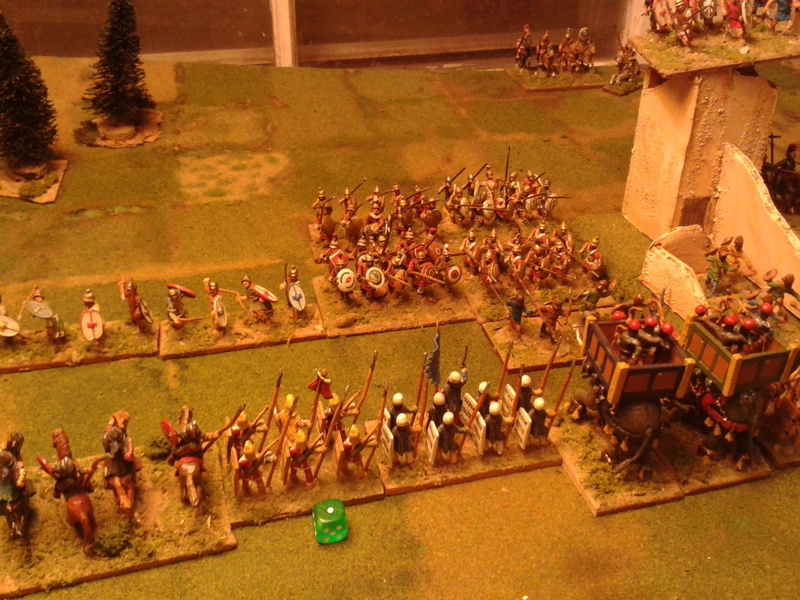 For Jeff, another view of the table as the Queen's troops advance. The Battle and how things worked. The game started simply enough with the Redcoats deploying into line just beyond range of the enemy artillery and advancing in line behind their skirmishers with the rocket and mortar firing overhead. This immediately brought up an issue as the wording of the overhead rule had not been harmonized with the changes to the fire chart so it said that the target would be counted as a difficult target but there are now 3 difficult targets rather than one. The same change, intended for proper fortifications accidentally lumped these and fieldworks into one category making the improvised barricade tougher than it was meant to be. I downgraded it to "cover" as intended and carried on but the language will have to be fixed. I also ran into a small issue with the mortars. Its been a long while since I used them under MacDuff (if I ever have) and the long range of 24" with no short range suddenly seemed very short and 2 dice of firepower very inadequate for the work assigned to it. I decided to see if classifying them as Superior would help balance the lack of short range (ie canister). It did but made them a rather hit or miss weapon which felt right. There was a different issue with the Riflemen, I had gratuitously granted the Riflemen "sharpshooter" status giving them a +1 for Superior firepower when shooting. They were rolling 2 dice per turn with a 5 or 6 being 2 hits and a 3 or 4 being 1 hit (1/2 casualties for troops in cover). On average they scored something like 1 hit every 3 turns. No sharpshooter status for them next game! As the Queen's troops advanced the rebel guns took what seemed like an awful toll. They at least had no problem rolling 6's. Having survived 1 blast of close range fire, the line was just outside charge reach meaning 1 more blast plus another when they charged. I began to worry if the scenario would work. Luckily I remembered the "Follow me" rule where by a commander can join a unit and add d6" of movement, taking his chances if they take fire. It was just enough to get both units into contact and the Pirate artillery rolled down for once. Each regular unit was fighting 2 enemy units, a gun and a unit of infantry. For a few seconds I felt a wave of nostalgia for the old individual melee combats but it would have been miserable trying to pair up figures over the terrain and as it turned out the system borrowed from HofT worked just fine. Even with the defenders suffering 1/2 casualties the Buff's broke their opponent during the 2nd round of melee and were able to occupy the position. The Tigers had a problem though, they took out the gun crew in the first round but not the infantry and they had taken heavier casualties than the Buffs. A quick calculation showed that while they might do it in a 2nd round a tie was more likely and being broken themselves was a distinct possibility. Therefore they chose to retire rather than fight a 2nd round. So far so good, it was a little sticky with a shaken unit of infantry with defended earthworks to their front and 2 units of Indians bearing down on their flank but the Lancers were there to cover them. It was now the defender's turn. (Turn 5 I think). The Indians came forward and fired at the Lancers who launched a reaction counter charge. 5 cavalry charging into 10 infantry was slightly in the cavalry's favour but 1's are no match for 6's and the 1st round was a draw. One Lancer had been lost to shooting (against the odds) and another in melee. They weren't Elite so the next hit would break them. The Lancers declined a 2nd round and pulled back. At the same time, the Fox led a counter attack and fought 2 rounds of melee with the Buffs getting the better of it and the Irregulars recoiling but not quite breaking. However, during the 2nd round, the die rolled for the Fox inflicted a hit while the die for General Turner came up "wounded". Technically there was no connection between these two events under the rules but the rules deal with outcomes not events and I do hate to pass up a chance to add narrative so a duel between opposing commanders became the story. Now Faraway had a problem, units out of place with morale teetering and no General so no orders dice, thus no rallying or turning to face. Here is where the command differences came in. The Brigade Order rule had allowed the regulars to advance with minimum usage of Orders while the ADC allowed them to store unused ones for later. When a General is wounded he does not get an Order roll on the next turn however if his ADC is still storing some unused orders they may be used, thus a regular army is affected but not necessarily paralyzed by the loss of a general. Faraway had enough stored orders to rally the Tigers and Lancers and brace themselves but the Pirates rolled a 1 for orders. Not much of a counter attack. By the time it came the Regulars had recovered, the 2IC had taken over and all units rallied, well apart from the Riflemen who stubbornly refused to rally either. No elite status for this unit next time! 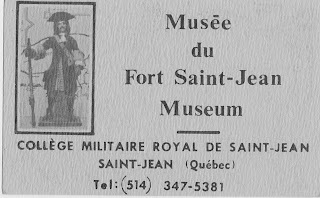 Of course they are named after a Montreal Militia unit. While all this was going on the rockets and gunboats had advanced and opened fire on the tower since their own men were too close to the enemy to allow overhead fire. At 1/4 casualties this should have been tough, especially since the Superior firepower mortar had a hard time getting any hits in the 2nd half of the game, 3 seemed to be the highest number on their dice. The Rockets had been spewing rogue rockets left and right, luckily not hitting any of their own, but once they set their sights on the tower battery, every rocket hit with the occasional 5 being the lowest number! A few turns were spent with the Brethren bring up reinforcements and using skirmishers to wear down the Queen's troops. At the start of their half of the 8th or maybe the 9th turn, (I forgot to track both turns and time) the Brethren had lost 5 out of 11 units (4 of these being artillery) and the next loss would break the army. Faraway had yet to lose any units but 4 out of 6 were very close. Everything was in position but for maximum effect they needed at least 3 orders, they got 5 and in they came. The attack by massed natives on the Tigers was nip and tuck but was repulsed after 2 rounds of melee with the Tigers being left 2 figures above breaking. The first attack on the Buffs was also repulsed with losses but Rifles broke on contact allowing the Fox to lead a pursuit into the Buff's leading to a 3rd round of melee. It was a long shot, needing the Buffs to whiff and the attackers to roll Boxcars, but it was a little nerve wracking for a few minutes. The Buffs of course held, 3 hits above breaking but the Brethren broke taking the army with them. The Reuse had to steam onto the table to bring the mortar into range. If the attackers hadn't been both Elite and Shock troops, I don't think they could have made it, not without at least another battalion of infantry. Every one of the infantry units had taken enough hits to have broken an average unit not counting the extra hits that had been rallied. In case the 1:2 odds in men and guns look steep for an assault on a fortification, they are basically what the British faced at Tel El Kebir and at various Sikh War battles and that was something else I wanted to test. From a Solo gaming perspective the game went really well. Once again I set this up so that I could play against the game to win or lose rather then just watching two sides as impartial (figure) mover and (dice) shaker. Despite having half expected the game to be a slam dunk, I twice found myself scrambling on the edge of defeat so from a purely game POV the game delivered just what I asked. I was also pleased that the rules again delivered the sort of game I wanted to play with actions and results that felt right and with a good mix of decision making and uncertainty or chance. We have just word of an attack by Her Majesty's troops on Nevaneva, an outpost of the Brethren on the south-east coast. It is well known that there were ties between the anarchist rebels along the Blue River and the Brethren and therefore it was not surprising that reports had been received that numerous rebels had fled there after their defeats at the hands of Royal troops. It was high time for this mix of Rebels, Renegades and Raggedy Pirates be taught a lesson. We have this eyewitness account from a correspondent who served with the expedition. The Commodore arranged for us to pass Freedom River at night with the steamers towing the troop transports when the wind was unfavorable. It was too much to hope for though that we would escape undetected and no one was really surprised to see a line of entrenchments from the river bank to the hills. The land along the river is quite flat and from the pilot house we could see clearly 5 batteries of guns, no doubt landed from the pirate fleet, in addition to a battery in the old tower that guarded the main harbour. There were a hundred or more armed men manning the fortifications or milling about behind them and no doubt hundreds of their savage allies haunting the woods. There were rumors that General Paz with the whole of the San Carlos army was also present but few gave it much credit. Her Majesty's redcoats advance rapidly across the plain under a hot fire from the defenders artillery while rocket's and mortars shells arc over head. To storm this fortress we had no more than fifty of the Queens infantry from the Victoria Rifles, Young Buffs and Green Tigers as well as five of the Company's lancers. The Commodore ordered a landing party to take a battery of light rockets with the troops and assigned the Reuse, who had been rearmed as a Bomb Ketch, to act in close support. General Turner was in over all command of the land force assisted by Brigadier Stoneforte in charge of the infantry and by Director Legge of the FTC acting as ADC and second in command. The troops landed and formed up outside cannon shot of the fortifications and advanced rapidly under a heavy and accurate fire with a skirmish line of riflemen leading the way. As expected the woods soon sent forth a howling horde of savage Atlantican warriors against the flank of the advancing line but the Lancers trotted forward to face them. As the red line neared the breastwork, the General and Brigadier each put himself at the head of a regiment and with a loud huzzah the line rushed forward without firing a shot. A shower of grape left the glacis covered in dead but the red line went up and over the top. Minutes later we could see the flag of the Buffs waving triumphantly from the battery nearest the river. 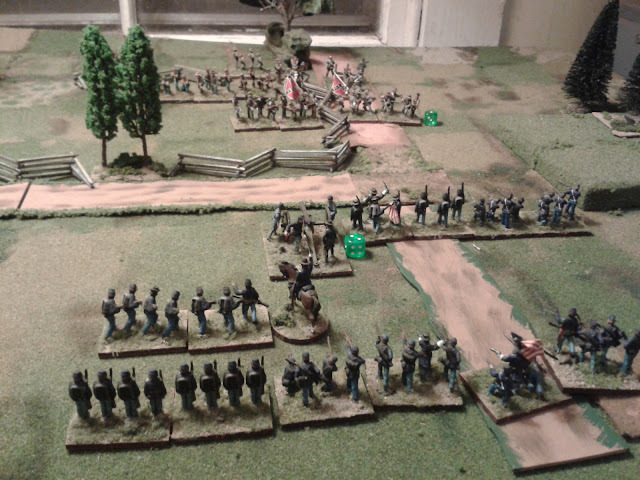 The Buffs with General Turner at their head capture their portion of the redoubt after a stiff fight. At the sight of this triumph, we set up a cheer, a cheer stifled moments later when the Tigers came bundling back over the barricades surrounding the central battery. We held our breath as a shockingly small band rallied on the plain with the Brigadier boldly exposing himself at their head but the guns had been silenced and the enemy must have been badly cut up as well since they seemed content to snipe at the Queen's men. On the plain the natives seemed encouraged by this and pushed forward but up galloped our cavalry, pennants fluttering as they lowered their lances and charged. We expected them to sweep the savages away but these fierce warriors are not easily cowed and their fire caused shocking casualties as the lancers closed. After a short tussle, we could see a handful of lancers rallying back to rest their horses and reform but the enemy seemed unwilling to advance and risk another brush with those riders. The Black Fox meets General Turner in single combat. It was hard to see what was happening beyond the redoubt but as the Reuse, having silenced the improvised shore battery, warped up the river to engage the tower, we were just able to see the shoulders and head of a horsemen in black and the tips of the enemy's pikes and flags. With a roar that we could hear over the rattle of musketry, the enemy surged forward. For tense moments we could catch glimpses of a prolonged struggle but at last the enemy receded followed by the Black Rider. Minutes later there was a stir and we could see a small party coming slowly, carefully, back out of the redoubt though the proud flag of the Buffs showed that they had held firm. Focusing our glasses carefully we could just make out that they were carrying a wounded officer. From our friends in the Buffs we later learned that General Turner had met this Black Horseman in hand to hand combat and been bested! From captured pirates we first heard the name Peter Iberton, the Fox as they call him, a new leader who has risen amongst the Brethren. An over view of the climax of the battle. For a few minutes our troops seemed to be paralyzed but soon Director Legge could be seen galloping to the front and runners could be seen heading out as the army pulled itself together. For perhaps half an hour the battle seemed stalled as both sides traded musket fire and gathered themselves for the decisive struggle while the Naval Brigade and Reuse pounded the tower. The Rocket battery proved especially effective, knocking the battery for sixes despite various rogue rockets which went sputtering off. Luckily the latter did not hit any of our men though there were some close calls, one landing not a fathom off our bow. At last the storm broke. With a degree of co-ordination not often seen amongst such rabble their whole line attacked. On our left the Tigers were nearly overwhelmed but inspired by the Director they held and the tide of native warriors receded. Beyond the redoubt we could almost feel the roar as the enemy surged forward. The rattle of musketry rose to a crescendo and the last handful of the Victoria Rifles were driven back into the plain. Onward surged the rabble, that Black Rider at their head, and for a moment we feared the worse for should the Buffs be evicted, there was little hope that they could storm the entrenchment again that day. At last however, the storm wore it self out against the Breakwater of the Buffs and the enemy broke. Scattering like leaves they fled to the woods and hills, leaving but a handful of snipers to cover their retreat. Gathering up the dead and wounded, we set about slighting the tower and destroying the wharves in the town. The ships and any goods of value had been removed before our arrival but it was a lessen these ruffians will not soon forget. It had been a near run thing though and I doubt that any troops less experienced and dedicated than these could have won that fortress against such odds. These Pirates and Savages and not a few of our own exiled Rebels seemed to have new resolve and I feel that we shall see this Peter Fox fellow again. Peter Iberton, The Black Fox, urging his men not to give up. Ed note: A military analysis of this action will follow in a day or 2. The more I thought about it, the more it seemed unlikely that General Paz from San Carlos would be present at this encounter or at least that he would be in charge of any but his own troops and I did not want more than 1 defending General since part of the idea of the game is to see if command advantages can help offset numbers. So what I needed finally, was a General for the Brethren. Out came my stock of Zinnbrigade castings. Its been double digits below zero in my casting shop for most of the last 2 months so I am relying on the Fall squirreling away of bits and bodies. One of my favorite officer bodies is the one from the Dragoons. I had a couple available, but what did a leader of Brethren look like? No books to help unfortunately. 7 other variations on the same Zinnbrigade body. The Dragoon officer in the center still has the original cast on head and no alteration except to adjust the epaulette since the arm is designed to point down not up. The rest have had head swaps and one has a hunting shirt added. All 3 arm variations come in the mold. The figure is designed to fit the galloping Napoleonic Dragoon horse but sits well enough on the more sedate 1900 Prussian horses. This is one of the issues with semi-historical imagineering. If it was complete fantasy on an alternate world, almost anything could go, if it was historical or fictional armies based on a real one like Faraway, I could check a uniform book. But,no, I haven't even worked out exactly who the brethren are in detail. A mix of men of all races but predominantly European and Atlantican with a sprinkling of others, lascars who jumped ship, escaped slaves and so on. So, a bit of Buccaneer but 19thC ish, a bit of Metis but coastal not buffalo hunters, a bit Mexican but not Spanish. They have no formal government and thus no army so a civilian General, yet one would expect a rich man of power to look the part and not dress like a common hand. Some of my pirate officers have plumed hats and tail coats so my first thought was a Green coat and plumed hat but he started to look too military and especially too Frontier Light Horse-ish. Its already established that Northern Atlantica is hotter than the south, most of his followers are in shirt sleeves, so I thought, ok straw hat. I took one from one of my sailor castings and added a head scarf underneath to tie him in with the pirates.. It looked OK but not special enough, I decided to file off the coat tails and add a short jacket worn open instead of buttoned up. Leaving him in long pants seemed right but something said "boots" so I filed down the overalls a bit and cut in the boot tops. I also had to reverse the epaulette because I pointed the arm up instead of down. Now for colour. Green with fawn pants is a favorite look but done. A little voice said black. Blue perhaps or is that too Oberhilse? Brown maybe? What if he was head of a Biker Gang? OK Black, black coat, and pants and hat. He started to look a little familiar but not ought of place as a leader of the under trodden seeking justice and freedom, even without a mask. I added some silver buttons and trim to show he has money and power and is not afraid to show it. The small plume became a fox tail. Without further ado, I present Peter Iberton, The Black Fox. Commander of the Brethren..
OK, the Brethren have a leader and the last of the in-between base ones have been mounted on washers, tomorrow I can play. The Brethren stand to their guns as the enemy are spotted. It was Sunday, it had been a week since I played a game, I've been wanting another game of MacDuff before I dip back into the small gridded stuff and I had a couple of free hours. Seemed like a good match but what to do? The last game was fun and I wanted something also fun but different. I wanted to test various grades of troops and something where one side had a mission and the other could be on auto pilot with occasional reactions. An assault then. Sometimes these things come slowly to me, I poked about a bit. I thought about various scenarios in books, about various historical actions in various periods and about various past games. I browsed the miniatures on the shelves. Slowly something came together in my mind, one piece leading to the next. An asymmetric game, irregular vs regular, an assault of fortifications. I started pulling out bits of scenery and trying them on for size. I counted noses. I've been dragging my feet on native Atlantican armies until I could figure out rules, history and so on and so they were unable to carry the burden. If I was going to stick with the glossy toys, the pirates would have to come out! I confess, I have been a bit shy about the pirate thing. They are one on my favorite original figures and I like the broad concept though based on Red Sea Arab and or Asian pirates not buccaneers from another era. Still there is Jean Lafitte and his lads and their successors survived off Texas till the 1830's and after all, these are TOY SOLDIERS! So, OK, out came the pirate Brethren and their Atlantican allies and out came the San Carlos Grenadiers who shouldn't be involved but are and will have to be written in since it is their 4th appearance together. An overview of the table minus the stone tower just off screen to the right. HMS Reuse will be sailing on her own little bit of the sea, an idea I first encountered in Morschauser's book but haven't tried before. Since Mavis called it to mind recently, I thought it might be a good way to allow the Reuse to put some distance between the her and the guns when prudent to do so. Once again, the Faraway Trading Company (FTC) has convinced Her Majesty to send royal troops on an expedition to try to suppress the troublesome Free Brethren, a self governing community of renegades composed of all races and nationalities. San Carlos has no suzerainty over the area but does have trade interests and a long standing alliance with the Brethren. The target of the expedition is the small town of Edgeport whose harbour is guarded by an old stone tower. The Queen's troops landed just South of the town intending to storm the tower and demolish it allowing the navy to sail in and destroy all shipping. As dawn breaks the scouts report a nasty shock. Surprise has been lost and the enemy has gathered in allies and reinforcements, landed guns from some of his ships and built an entrenchment of cotton bales. Still, an attempt to silence the tower must be made. Allies gather in the hills. I'm rather enjoying having the game laid out and may just take this opportunity to finish refurbishing and standardizing basing, make some repairs and maybe even add a few more figures before I play the game later this week or even next weekend. A better pirate general would be nice and General Paz really deserves his own figure.